Before I came to UK and Europe I was so busy that I didn't blog about the food that I've been cooking. Though being busy on a lot things didn't hinder me to still cook the dishes I want to concoct. Cooking is one thing I won't get tired doing no matter how busy and tired I am after a whole day of work in the office. So having said that, I want to post the very first dish I baked in my newly acquired oven which was given to me by the owner of my apartment. They decided to buy one for me instead of me buying it because of the fact that I am renting a fully furnished apartment, so I think the owner just did the right gesture. Inspired by the French cuisine since I visited Paris last October, I finally decided to make Ratatouille for the first time when I came home from my trip. And not to mess with the recipe, I baked it! Going back a few years ago, people became more familiar with the dish when an American animated film made it as a title. The film is about Remy a rat who wants to be a chef and be in the heat of the kitchen. Sounds gross but it appeared a little cute. Then people from around the world were surprised to find out that it's a famous vegetable dish from France. 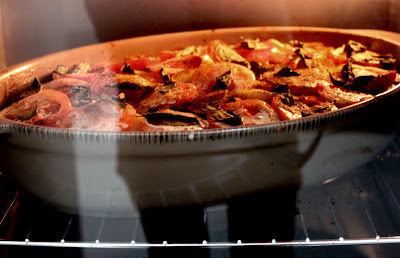 Ratatouille came from the Occitan word "ratatolha" of the Occitan cuisine. While touiller means "to toss food" This dish originated from Provence and Nice and spreading its different version around France and the entire globe. Cut the vegetables according to shape like the aubergine, zucchini and tomatoes. For the Butternut Squash and Capsicum, cut it diagonally. After cutting all your vegetables, prepare a large bowl. Put all the vegetables together then start adding the crushed Garlic, Thyme, Marjoram, Paprika, Pepper, Salt and Olive Oil. Toss them together then prepare an oval or circular ceramic baking tray. Add some butter on the tray then start arranging all the vegetables together in layers as Julia Child did in her cookbooks. Then pour in the remaining sauce it created in the bowl while tossing it. Top it with some butter, grated mozzarella cheese and fresh basil. Bake it on 350F from 40 minutes to 1 hour depending on the volume of you are cooking. Bon appétit à tous mes! Yum Yum Joanie, this is the time of year for that dish with the summer vegetables so good! I love this baked version of ratatouille! Thanks for sharing. hello and Happy New Year 2011~! • Ohhh Mama Joy I have to be inspired with Jamie's summer recipes! •Always welcome Ellie. Thanks for dropping by. Paprika must be your favorite spice? Tastes wonderful in the Ratatouille, I guess. Hey I'm a bit excited with the turkey...post it!!!! Such a fabulous recipe. Love the Blog .. keep posting! oh yum... this looks amazing! 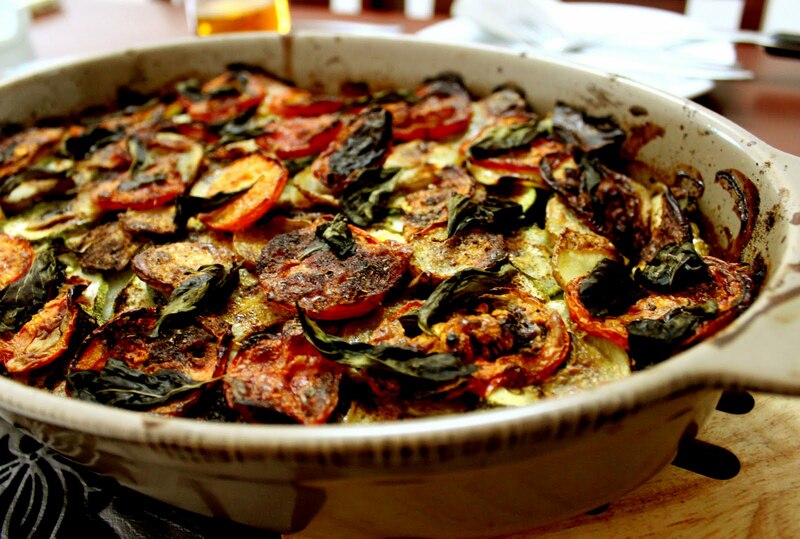 i love ratatouille, but i've never prepared it baked. mmm!